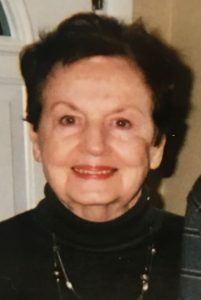 Ann Catherine (Pierce) Cassidy, in Woburn, October 15th, 2018 at eighty two years of age. Beloved wife of fifty years to James J. “Jim” Cassidy. Loving mother of James L. Cassidy, his wife Kelly of Fitchburg and Brian Cassidy of Woburn. Loving sister of Theresa Skaling of Stoneham and the late Joannie, Dottie, Betty, Irene, James, Henry, Richard and George Pierce. Cherished “Nannie” of Jack and Grace Cassidy. A Funeral will be held from the Lynch-Cantillon Funeral Home, 263 Main Street, Woburn on Saturday, October 20th at 9 a.m. followed by a Funeral Mass in St. Anthony Church, 851 Main Street, Woburn at 10. Interment in Woodbrook Cemetery, Woburn. Relatives and friends are respectfully invited to Calling Hours, Friday evening 5-8 p.m. Remembrances may be made in honor of Ann to the Dana Faber Cancer Institute and the Jimmy Fund Organization, P. O. Box 849168, Boston, MA 02284-9168. Ann Catherine (Pierce) Cassidy, a long time resident of Woburn, passed away at her home, Monday, October 15th, 2018, at eighty two years of age. Ann was the beloved wife of 50 years to James L. “Jim” Cassidy. Born and raised in Somerville, as one of nine children, Ann was the beloved daughter of the late James and Theresa (Buckley) Pierce. Ann was educated in the Somerville Public School and a graduate of Somerville High School. Ann met her future husband, Jim at a gathering in Everett. Four years later they married and celebrated fifty years last May. They bought a house in the North Woburn section of the city, where they have made their home. They brought two sons into the world of whom they were so proud! Anna dedicated and devoted her life to her family whom were her world. Their home was meticulous. Everything was always neat, clean and sparkling and in the place where it should be! Ann and her family, frequently traveled during the summer months and had wonderful vacations in New Hampshire, as well as Yarmouth, at the Cape. Ann and Jim also had the good fortune of being able to travel to various destinations such as Ireland, San Francisco, Canada, Florida, Disney World, and Vegas, enjoying it all. A selfless, faith filled, woman who always put others before herself. Ann would give the shirt off her back to anyone in need. Ann’s greatest accomplishments throughout her life, was her family. Any and all times spent with her family was truly the most important and happiest part of Ann’s life. When her grandchildren arrived, that just added another beautiful and loving dimension to her life, which she cherished. “Grannie”, will be deeply missed but never forgotten by those she loved. Along with her husband Jim, Ann is survived by her two sons, James L. Cassidy, his wife Kelly of Fitchburg and Brian Cassidy of Woburn. Loving sister of Theresa Skaling of Stoneham and the late Joannie, Dottie, Betty, Irene, James, Henry, Richard and George Pierce. Cherished “Nannie” of Jack and Grace Cassidy. A Funeral will be held from the Lynch-Cantillon Funeral Home, 263 Main Street, Woburn on Saturday, October 20th at 9 a.m. followed by a Funeral Mass in St. Anthony Church, 851 Main Street, Woburn at 10. Interment in Woodbrook Cemetery, Woburn. Relatives and friends are respectfully invited to Calling Hours, Friday evening 5-8 p.m. Remembrances may be made in honor of Ann to the Dana Faber Cancer Institute and the Jimmy Fund Organization, P. O. Box 849168, Boston, MA 02284-9168.